The tools described in this section involve digging and have a long handle; a trowel is in the next section. Here we talk about shovels, spades, forks, and such. In the past three weeks I’ve dug 42 holes in which I planted all manner of shrubs. Nancy got kind of carried away this year. Last month I dug over 200 feet of vee-shaped ditches to edge our main flower bed. And next week, with stored energy from all that physical exercise, I will turn over the 600 square feet of vegetable garden and cover those beds with their winter layer of straw mulch. All those digging jobs involve working in heavy clay soil which can be a daunting challenge. After some experimenting I have settled on three tools for most digging jobs. I use a pointed shovel for digging holes. My flat edged digging spade is the tool to edge a garden bed, and my garden fork makes turning over the veggie patch less onerous than it might be. The three models of these tools I have come to prefer are made by Fiskars (www.fiskars.com . They have been available for a few years, but have not taken over the consumer market by storm. I think some of the features I consider valuable may not be so important to some folks. These tools are as tough and strong as any digging tools I have ever used. The handles are made of steel rather than of more traditional hardwood. Consequently, they seem to be on the heavy side. However, I found that after using them for a period of time, because they made the job easier, the weight did not become a problem. You may think a shovel is a shovel, but these digging tools by Fiskars have at least three new design features that are unique and make them desirable. Shovels usually come in two sizes. One has a stick handle, usually hardwood, that is about 4 feet long. The other is shorter at two feet and has what is called a “D” handle on the end of the stick. All three Fiskars tools have three foot handles and all have “D” handles that are double wide and oval shaped so you can hold the shovel or spade in position to begin digging using two hands. Then over the shovel or spade blade is a bent over step for pushing down the tool with your foot. Again, not unusual except the step on these tools is twice as wide as any others. With our heavy clay soil, I can get the shovel or spade started with a push of my foot, and then I can put two hands around that oval shaped “D” handle and literally jump up on to the step of the tool with two feet. With my modest 235 pounds, that shovel will definitely go deeply into that clay. There is an ergonomic feature in the design of these tools that might go unnoticed but is a benefit when using them for a period of time. The stick part of the handle is not round like most digging tools. It has a tear(drop)shape which Fiskars found is more comfortable to the hand while repetitively picking up a load of dirt when digging that hole or edging that garden. 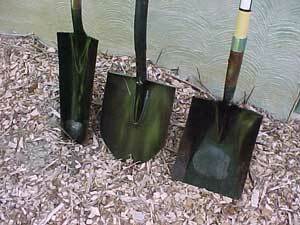 The shovel and spade can be found at most Lowes stores. The garden fork is a bit more difficult to find at retail. I no longer use the traditional wooden-handled shovel. It has been upstaged by two shovels that now serve all of my digging needs. One shovel is made by Radius, http://radiusgarden.com, and the other is made by Fiskars, http://fiskars.com. Each has features that traditional shovels do not have. Neither tool has the traditional stick handle. The Radius shovel has a circle at the end of a handle which allows two-handed control. The Fiskars has a large D-shaped handle -- also big enough to allow two hands to do the heavy work. Because both tools have steel handles instead of wood, you really can get some good leverage in tough soil without worrying about ever breaking it. The unusual handles on both tools also have ergonomic value in that your hand or hands are at an angle to the ground that is easier on the joints. Why do I use two different shovels? The Fiskars shovel is heavier and has a much larger step on the top edge of the tool, so I can literally jump up onto the step with both feet when I am struggling with our terrible heavy clay soil. With my lithesome 205 pounds, that shovel will definitely go deeply into that clay. It might not be the shovel of choice for women because it is quite heavy. The lighter Radius shovel, with a stainless-steel blade, is perfect for digging in soil that is not similar to cement. Because you can hold the circular handle at many different angles, your hands don't get tired so fast because they experience less strainBoth shovels have the blade mounted to the handle at a slight angle -- again offering an ergonomic benefit reducing wear and tear on the old body (well, my body is old). Both of these tools are as tough and strong as any digging tools I have ever used. WHENEVER YOU NEED A PICK, WHICH IS NOT OFTEN, YOU SELDOM OWN ONE. This tool is essential in certain jobs especially if you live in rocky or heavy clay soil. The Ames True Temper garden pick with 2-1/2 pound head weight has a mattock design perfect for digging and breaking up hard-packed garden dirt. Built for strength and durability, the head of this garden pick is made of heavy duty forged steel and the far reaching 36-inch long wood handle is made of the highest grade hickory. Garden Pick with 36-inch Wood handle. Perfect for use to dig and grub into the hardest of earth.